Story blurb: In 1588 a young mercenary and the son of an English earl meet by a quirk of fate. Dermot Channon is a soldier, while Robin Armagh has been sheltered on his father’s estate. Love blossoms fast while war looms on the horizon. Under the thundercloud of armed conflict, Channon leaves England and the Spanish Armada sails soon after. Robin despairs of seeing him again, for their countries are locked in an endless struggle. Years fly by, and in 1595, when Robin’s brother is taken for ransom in Panama, the dangerous duty of delivering the price of his life and liberty falls to Robin. He sails with the historical ‘1595 Fleet,’ commanded by Francis Drake, hoping to bring home his brother. But Fortune has other plans for Robin and Channon. Ahead of them is an epic adventure in hazardous waters where old enmities, Spanish and English, shape their future together — and try to drive them apart. 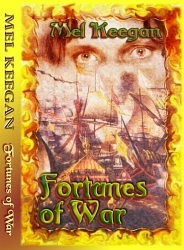 I love a plot-driven story, especially if the plot is as meaty as “Fortunes of War,” by Mel Keegan [Dreamcraft, 2005]: the intrigue-ridden court of Elizabeth I, war and rumours of war, likable lovers and pirates. It has them all. 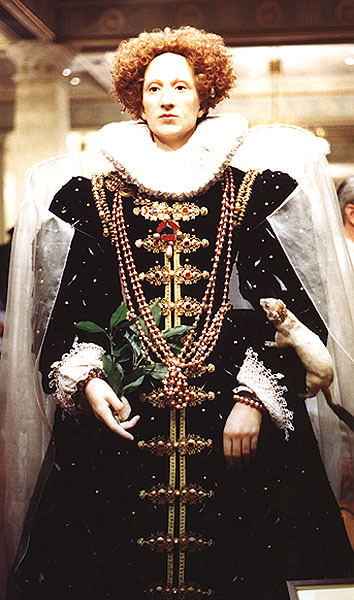 The story is written in two parts; the first part being an introduction, and here Keegan has done a masterful job of introducing the main characters while capturing the conspiratorial nature of the Elizabethan court. The two main characters, Robin and Dermot, are ably supported by a cast of interesting personalities—the cold-hearted Earl of Blackstead (Robin’s father), the aging Spanish ambassador and Dermot’s uncle, and the villainous Earl of Bothwell, to name a few. The underlying conspiracies are interesting, as well; Catholics against Protestants, England against Spain, and foe against foe, all cleverly woven into the fabric of the story. Five stars for the first part, therefore. However the second part starts out rather slowly, almost cumbersome in spots, and for a brief while the story looses its momentum. Another minor drawback in second part is with the characters—Guillaume in particular—who come across as rather stereotypical. These are not major blemishes, but they are enough to detract from what would otherwise be a five-star achievement. Nevertheless this is a superbly written, intriguing and captivating story that will have you turning pages to discover what will happen next. Progress report: Coming of Age on the Trail is still in the hands of the editor. In the meantime I have made a start of The Brit, The Cupid, and Petunia. Click here to read an excerpt.